Our Rocky Trails jewelry theme uses colors that reflect the beautiful and rugged Southwest desert. Using stone combination colors of light brown, golden brown, black and opal, these handcrafted items are sure to capture the imagination. To tribes of the Southwest, the land is considered sacred, and this jewelry pays homage to the spiritual beliefs of the artists who inspired this revered collection. Rocky Trails is part of our exclusive WhiteRock Collection, a stunning selection of beautifully designed jewelry, which is handcrafted using genuine sterling silver and the multicolor inlay method. Crafting inlay jewelry is an art that takes some jewelry makers years to master. Stones are meticulously cut, ground, shaped and placed into sterling silver. Inlay is a method made famous by the tribes of the Southwest. The technique was invented by Native American artists and perfected over more than a century. The Zuni and Navajo are perhaps best known for creating stunning inlay jewelry. The tribes who perfected the art of working with silver inspire the Rocky Trails theme. It is a truly unique and distinctive theme with a stunning color pattern. Every stone used in this collection is hand selected to ensure the highest level of quality, beauty and durability. These stones are used to create the stunning color combinations that represent the dazzling beauty of the desert land that tribes have cherished for thousands of years. 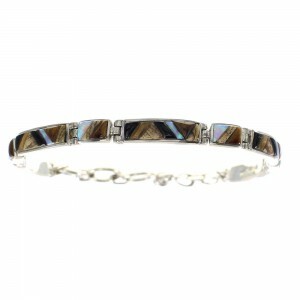 Tiger-eye is one of the most popular stones used for our Rocky Trails theme. It is well known for the golden yellow reflection on brown color. The stone is mined in South Africa, Australia, Indiana and California. Onyx is the most popular stone used to create the black shades found in the Rocky Trails theme. We also use black jade, black shell and jet. Some cultures believe onyx harbors spiritual and healing powers. It is believed onyx can help release negative emotions and aid in ending unhealthy relationships. Used in conjunction with tiger's eye, the stones mingle together beautifully to create the stunning effect of color our WhiteRock Collection is famous for. Opal is also used in the creation of much of our Rocky Trails theme. It's vibrant blue color and semi transparent composition creates a beautiful interplay of colors that mends perfectly with the shades of brown and black used. The stones used in each piece can vary based on availability and color. See the individual product descriptions to see which stones may have been used. 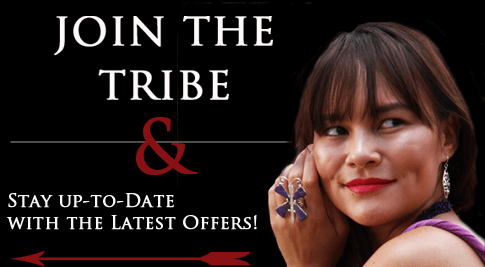 SilverTribe is offering this exclusive collection of jewelry at a great price. Our customers trust us to provide the most beautiful, high quality products at the best prices available.